Bringing a wealth of talent and experience from their previous musical endeavors, the members of The Phoenix Theory have come together to form one of Detroit’s newest premier cover bands. The Phoenix Theory takes listeners to new heights of musical entertainment by performing tightly rehearsed renditions of your classic rock and dance favorites from the 70’s, 80’s, 90’s and today…it’s the music you love to hear played the way you remember it. Combining integrity, professionalism, and a high energy, lighthearted approach to their show, The Phoenix Theory delights the senses and provides a fun-filled, enjoyable atmosphere for all ages. Whether you sit back and relax, tap your feet in your seat, or dance the night away, it’s sure to be a memorable evening. 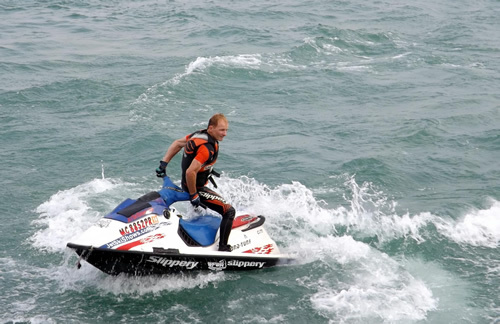 Nuttall, or maybe better known by his stage name “Typhoon Tommy,” is a champion jet skier who has traveled the world to compete in places like Turkey and Mexico.